Providing us with documentation that shows your buying or service experience* lets us verify that you're eligible to write a review. This helps us create a more trustworthy online review community. 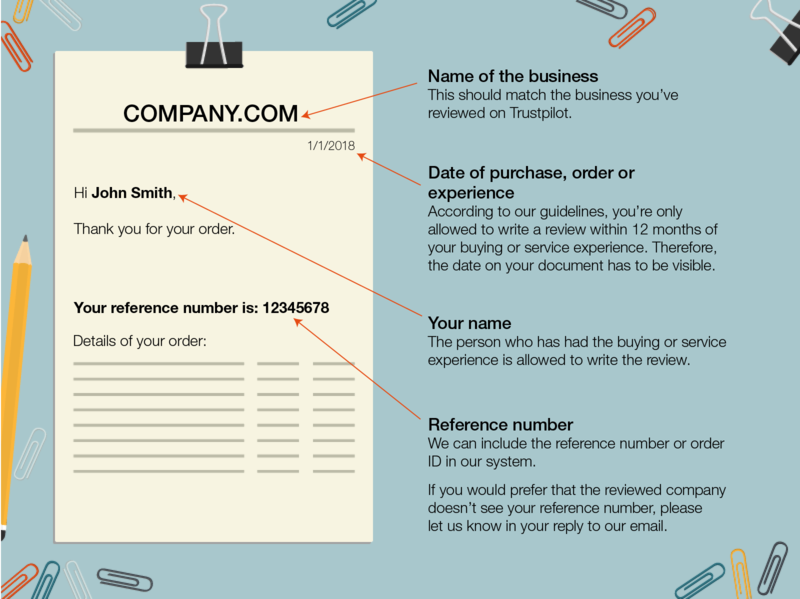 Trustpilot's Compliance Team can request documentation if we've been notified that a review is posted on the wrong domain, and need to check whether this is the case or not. What types of documentation can we accept? If you don't have one of the documents listed here, you can send us what you do have if you believe it demonstrates a buying or service experience with the company - and we’ll be happy to consider it. If there's enough information to verify your experience and get your review back online, we'll do our best to make sure that happens. A reference number or order ID. Please don't send us any sensitive documents - such as, for example, copies of passports or medical records. If your documentation does contain sensitive information - such as bank account details - please be sure to redact or black out those parts before sending it to us. We know that not everyone's an IT whiz. For help with creating screenshots from a laptop or PC, see this guide. *Note: At Trustpilot, a buying or service experience includes purchasing a product or service, placing an order, or using a company's services in a way that can be documented - such as via correspondence or interaction with the company. See our User Guidelines (US version, UK version) for more. **If the review was not left in response to an invitation sent via Trustpilot's systems, we ask companies to get in touch with reviewers via our Find Reviewer tool first.